Wilson Central failed to win their second game against Station Camp on coming home night, losing 47-39. Neither team was was able to find their offense in the first quarter, as only 4 points were put on the scoreboard in the first eight minutes of play. Nicole Brill and her post work gave Wilson Central the early 2-0 lead, but a pair of Olivia Delk free throws gave Station Camp the tie going into the second quarter. 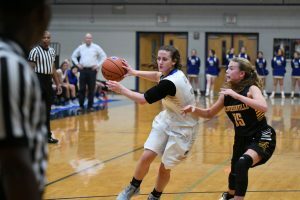 From there, both teams were able to put up several more points, but the Lady Cats did not find their usual offense. Sydnee Richetto put up 16 points, but it was off of 4-22 shooting from the field and a perfect 4-4 from the free throw line. Nicole Brill went 5-6 from the paint with a perfect trip to the charity stripe, giving her 12 points. Richetto and Sydney Dalton combined for 12 rebounds, but their effort was not enough to edge past the Lady Bison. Breanna Burns led scoring for Station Camp with 16 points, hitting 4 threes and 4 free throws, and Faith Eubank followed with 11 points. Burns also led Lady Bison rebounding with 7, getting 2 assists as well. Station Camp’s offense found their spark in this duo, ultimately giving the Lady Cats their ninth loss of the season. Wilson Central fell to 15-9 (5-7).